It was 90 degrees in Los Angeles. I know it's snowing in Buffalo, but here it is spring (or maybe even summer). So last night I fired up the grill for the first time, marinaded a skirt steak, threw some sweet potatoes in the oven (note to self: roasting potatoes in oven for an hour heats up the house), and tossed some cherry tomatoes with mozzarella, fresh basil, olive oil, salt, and pepper. Then I hit the Cabernets. I love grilled steak with Cabernet Sauvignon, and I have three recommendations for you: one under $10, one under $15, and the other just a hair over $20. Even if you are experiencing snow, these wines would also be good with stews, braised short ribs, or a pot of chili. Under $10: 2009 Big House Wine Company The Usual Suspect Cabernet Sauvignon (suggested retail $9.99; available for $6-$10). Not the most complex Cabernet, perhaps, but a solid example of the grape with characteristic plum and currant aromas. The palate was dominated with plum notes and accented by a bitter taste reminiscent of coffee grounds. The aftertaste was nicely bitter, too, which kept this fruit-forward wine from becoming too jammy. A touch of Grenache is blended into the Cabernet. Good QPR. 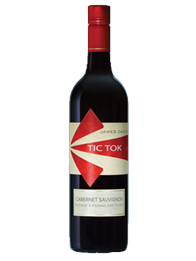 Under $15: 2009 Robert Oatley Cabernet Sauvignon James Oatley TIC TOK (suggested retail $14; available for $12-$16) This is another fruit-forward Cabernet, with currant and blackberry aromas and flowers. A spicy aftertaste is accompanied by nice tannins that have just enough grip. Very good QPR. Just Over $20: 2008 Viña Robles Cabernet Sauvignon Huerhuero Vineyard (suggested retail $22; this new release currently available at the vineyard; previous releases available elsewhere for $15-$25) This was a wonderful wine, and tasted like something considerably more expensive than the sticker price. Aromas and flavors of currant, pencil lead, and eucalyptus made for an elegant and complex wine. With air, the currant notes turn plummy. The aftertaste is smooth, with spicy, well-integrated tannins. This is a lot of wine for $22, and excellent QPR. Full Disclosure: I received samples of these wines for possible review. Last week I was extolling the virtues of red blends. After I wrote the post, I realized that though there were many red blends in my cellar, there weren't many white blends. I'm not sure why that's the case, because what goes for reds is true of whites as well: the blending can make the wine especially food friendly and versatile. And, just as with red blends, there is often a very attractive price tag on a white blend. So I looked in the closet to see if I had any white blends and discovered a bottle of the 2009 d'Arenberg The Stump Jump (suggested retail $10; available for $9-$13) This is a blend of Sauvignon Blanc, Marsanne, and Riesling. As with most good blends, you can identify the individual components in the finished product. In this case, the Sauvignon Blanc is evident in the aroma which is very grassy, and that grassiness is accompanied by touches of honey from the Marsanne. The flavors have notes of pear, grapefruit pith, and a bit of litchi--so there's more Sauvignon Blanc and Riesling influence there. The mouthfeel is heavier than some whites, thanks largely to the Marsanne. The aftertaste reminded me of a dry Riesling, with its acidity and apple notes. I would have liked the wine to be a bit more fruit-forward--which is not something I say often. Even so, this wine is a good candidate for a house white because of its versatility and very good QPR. I looked over my notes from previous vintages, too, and this wine has consistently been good all the way back to 2004, which is another reason to try a bottle if you see one in the store, irrespective of its vintage. Proof of the wine's versatility can be had by pairing it with something like this Soba Noodle Salad with Salmon and Asparagus from Bon Appetit magazine. With the rich salmon and avocado, the grassy asparagus, and the ginger-soy dressing, it's a bit of a challenge--but this wine handled it beautifully. The Sauvignon Blanc worked well with the asparagus, the Riesling with the Asian flavors, and the Marsanne stood up to the buckwheat and salmon. Full Disclosure: I received a sample of this wine for review. Last week I was extolling the virtues of spring. Now it's grey and drizzly again. In some places, it's still snowing. With the variable weather, it's hard to know which way is up. Do you dust off the grill and barbecue chicken? Or do you make a pot of stew? And what do you drink in the wine department, given it can be 86 degrees one day and 59 degrees the next? Regular readers know that I love red blends because they're food friendly. This time of year, though, I am especially fond of them because their versatility means that they are as welcome next to grilled chicken as they are soup. So when the weather gets this way I make a bit pot of chili, pick out a red blend, and no matter whether if feels like June or January I'm ready to go. A red blend I enjoyed recently with a pot of beef and black bean chili was the 2006 Tamarack Cellars Firehouse Red from Washington state's Columbia Valley. ($19.69 in my local independent grocery store; this vintage available for $20-$25, but more recent vintages can be had for $14-$22) Composed from a blend of Cabernet Sauvignon, Cabernet Franc, Syrah, and Merlot, the result is a juicy, fruit-forward wine with good structure. I've had my bottle for several years, and it's drinking just great now. I detected aromas of blueberry, cinnamon, and baking chocolate, all of which are echoed in the palate. The wine retains a fresh, lively taste through the mouth-watering aftertaste, with some additional herbal and spice notes. What I enjoyed most was the play between the varieties: the Cabernet Sauvignon lending its weight and acidity, the Syrah providing those soft berry flavors and spice, the Cabernet Franc lifting the blend with some acidity and herbs, and the Merlot making it approachable and inviting. Very good QPR.